One minute I was a courier for criminals, making ends meet so I could take care of my little brother. The next, four stunningly hot Norse gods had brought me back from the dead with wings sprouting from my back and a whole set of valkyrie powers. I guess that's just how life goes sometimes. Too bad our victory over our supernatural enemies turned out to be a farce. The divine home I thought I'd receive is a trap instead. A trap that's slowly closing in on us, dredging up every painful moment from our pasts. Can I trust these tempting godly men now that I've seen how many secrets they've kept from me? And what am I going to do if I have to face my own darkest horrors all over again? I'd better figure that out fast. Because I'm Aria Watson, and I will not be broken. I enjoyed this continuation of the Their Dark Valkyrie series. Bound to Gods does not have so much happening plot-wise as its predecessor. Instead, it focuses on the characters, giving us glimpses into the gods' pasts (drawn from the myths), helping us understand more from whence their current actions stem. I particularly enjoyed Chase's take on Odin's involvement in Loki's actions prior to Ragnarök, because it mirrors how I addressed the issue in my own Norse myth-inspired novel. Nice to see someone else interpreting it the same way I did! 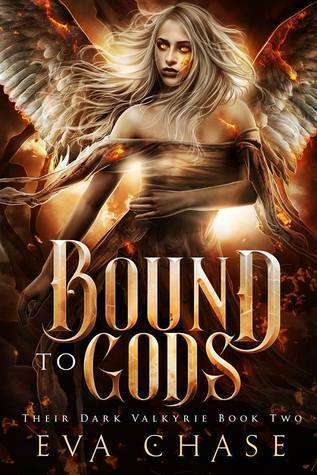 The action heats up between Ari and gods in this one, after the slow burn of book one, and the story ends in a way that sets things up perfectly for an action-packed third instalment, which I will look forward to reading upon its release. This series is sure to please fans of reverse harem fantasy and myth retellings.